So I’m interrupting your regularly scheduled programming (French recipes) because holding back this recipe from you guys for another couple of weeks just seemed cruel. 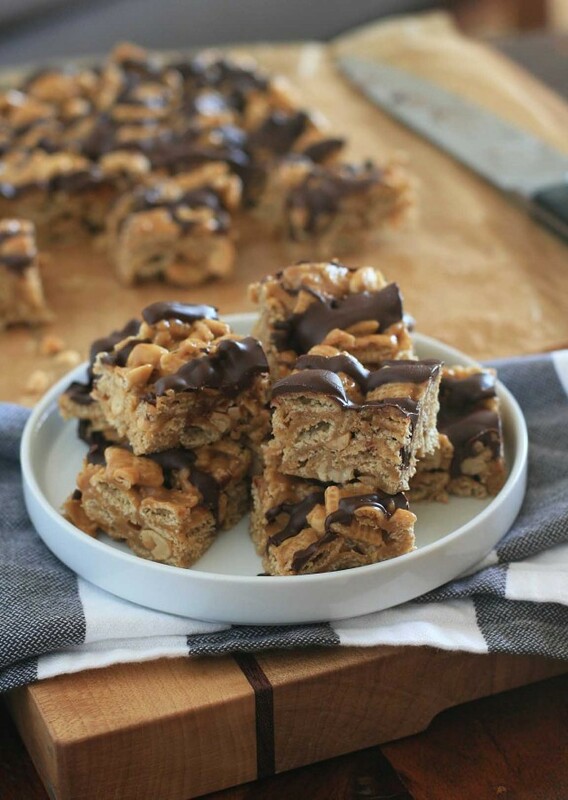 I came home from the supermarket with four boxes of plain Chex over the weekend, creating the perfect opportunity to make these bars, which I’d pinned several months back. One look at the ingredient list and I knew they’d be a winner. Chex (naturally gluten-free! ), peanut butter, caramel, peanuts and chocolate? How could these be anything but amazing? I made them once exactly as written in the original recipe (very, very good), but make some edits for the second batch to make them a little less salty and a bit crunchier. 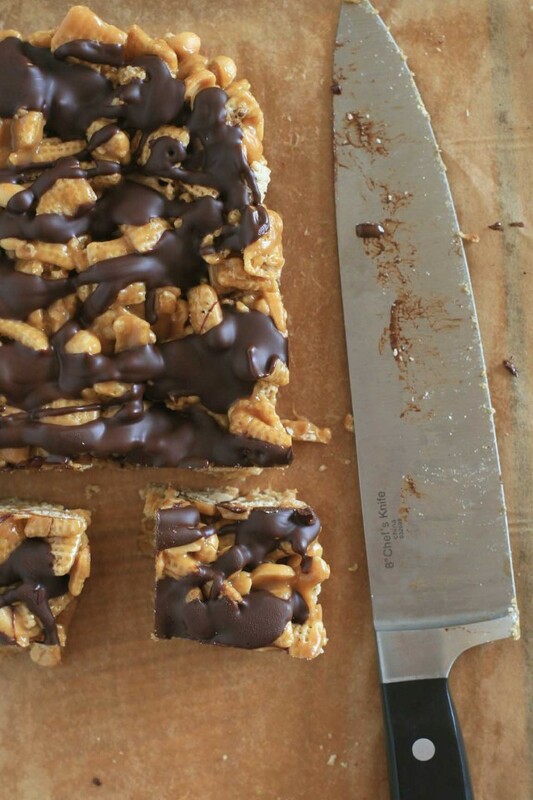 Don’t worry, there’s still plenty of peanut butter caramel goodness to coat each and every Chex piece. You might want to save these for a day when you know when you’ll be having company or kids over (or not… I won’t judge). Because I promise you that these will disappear shockingly fast. It’s sort of like having two dozen Twix or Take 5 candy bars out and unwrapped. Totally dangerous. 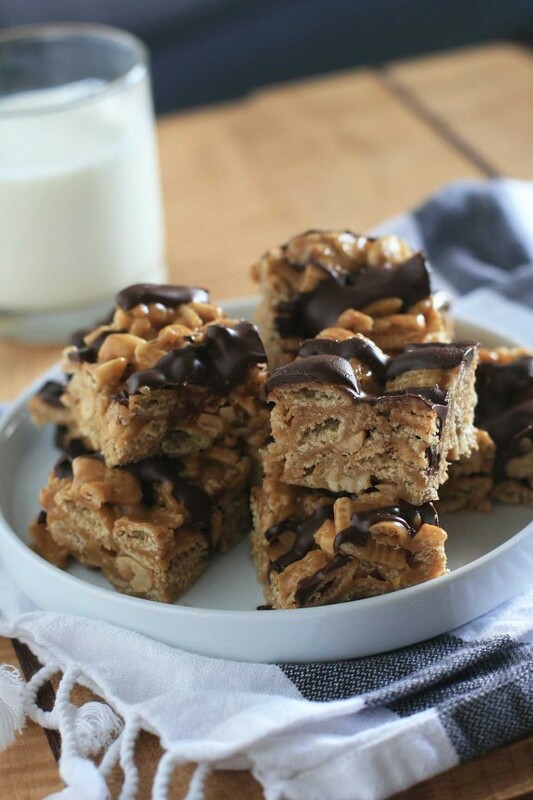 I should also warn you that Rice Krispy Treats will seem completely inadequate as a cereal bar after you get a taste of these. Use butter to lightly grease a 9-inch by 13-inch pan. Alternatively you can line the pan with parchment paper and lightly grease the parchment set the pan aside. 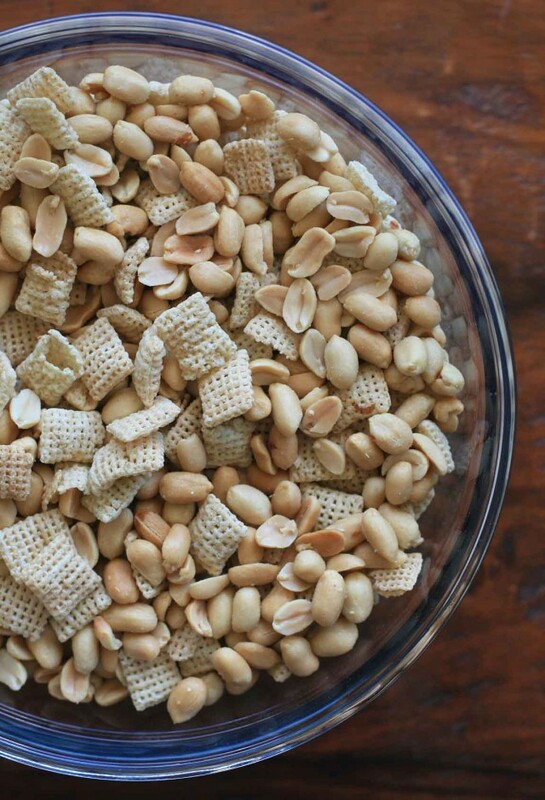 In a large bowl combine the Chex and peanuts. Lightly toss and set aside. In a small saucepan combine the brown sugar and corn syrup and stir to mix. Set over medium-low heat and cook, stirring, until the sugar dissolves. Increase heat to medium and bring to a boil. Let the mixture boil for one minute without stirring. Remove from heat and add the peanut butter, vanilla and salt and stir until well-combined and smooth. 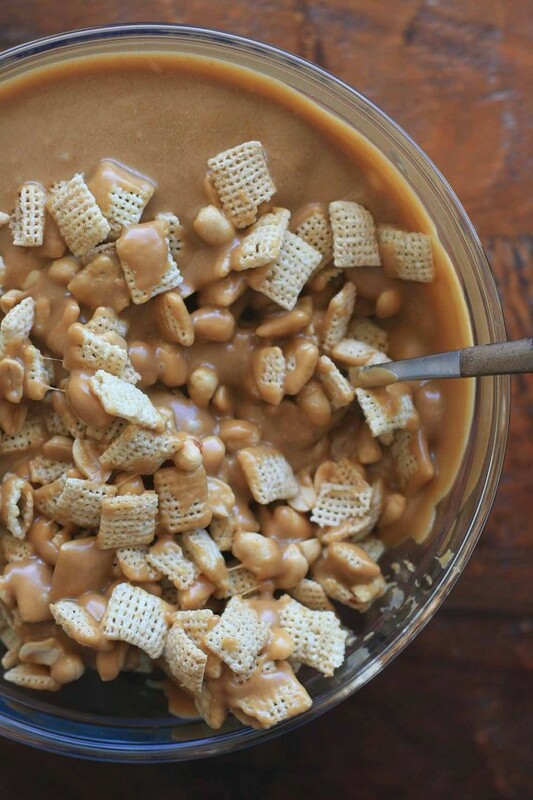 Pour the peanut butter caramel sauce over the cereal mixture and toss gently but thoroughly, trying your best to not crush the Chex. Transfer the mixture into the prepared pan. Use your hands to gently press the mixture down evenly (you can lightly grease your hands if desired. Also be careful as the mixture will still be somewhat hot). Let cool for at least 20 minutes. Melt the chocolate chips using a microwave or double boiler. 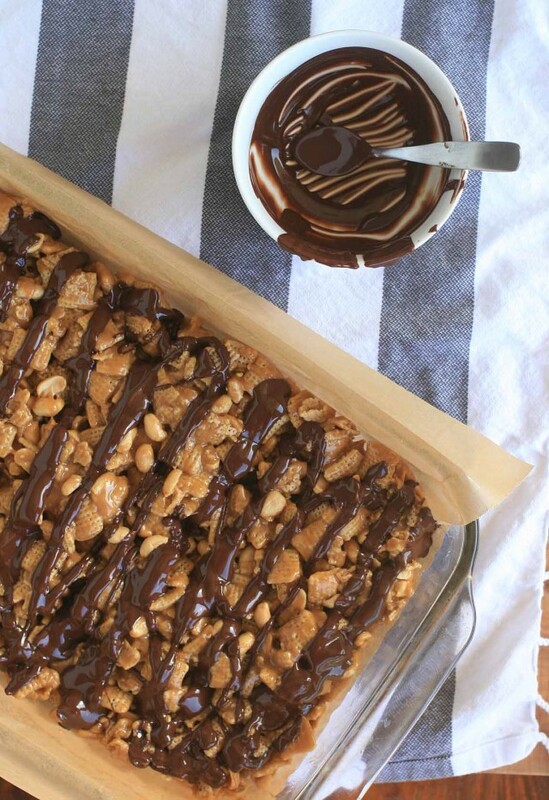 Use a spoon to drizzle the melted chocolate over the bars. Let cool completely, placing the bars in the refrigerator if necessary to make sure that the chocolate hardens. Cut the bars directly in the pan or, if using parchment, lift the bars out of the pan using the parchment paper and then cut on a cutting board. Store in an airtight container in the refrigerator or at room temperature in cooler climates.